Maybe the one or the other already heard about Jena, but where it is, surely knows nobody. 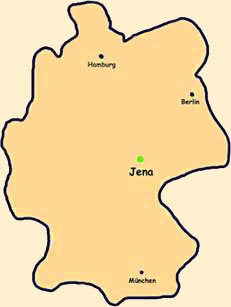 Jena is in Germany in eastern Thuringia, the "grean heart of Germany". You can found it on the 51th parallel. From nord to south there is the river Saale, from east to west the motorway A4 crosses Jena. Jena is surrounded by hills (almost little mountains) and is a very longstreched city, because of it's in the valley of the Saale. We're almost 100'000 inhabitants and there are a lot of students because the university of Jena is one of the best in Germany. In the center you can reach everything by walking in about 5 to 10 minutes and you can reach the farer districts by bus or tramp. There are two railroad stations and one is for the ICE. In the center of Jena there's also a big park and a good way for biking or inline skating along the Saale. you are here: Jena/Where is Jena?